In the world of projectors, there are those which are used in the home and those which are used in professional environments. Whilst they might perform similar functions, in practice, they’re actually significantly different, with strengths and weaknesses which mean that, although they all project images, some are more suited to professional applications than others. For most people, it’s a pretty confusing distinction – especially if you’re not familiar with what to expect from a projector’s specifications. But what separates a projector designed for professional environments from those which thrive in a home cinema set up? Let’s take a look at the features you need. Projectors have gotten significantly better at operating over long periods in recent years, but there remains a gap between what professional projectors are capable of and what home users can expect. 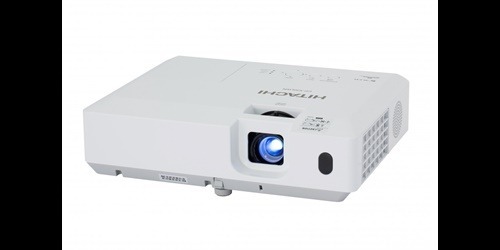 A projector like the Hitachi LPWU6500 has a laser light source which lasts for approximately 20,000 hours without issue. That’s ideal for scenarios like digital signage applications that require long hours of continuous projection. Industrial and commercial applications will typically place immense stress on a projector, with many running 24 hours a day, 7 days a week. A projector designed for home use can often fail when put through this stress and are significantly more likely to fail over the course of their lifetime. With the cost of a replacement projector potentially rising to hundreds of pounds, it becomes clear that 24-hour operation is a valuable feature for professional projectors. In the home the typical use-case for a projector will be during the evening when the sun goes down and the curtains are drawn. In these scenarios, the brightness of the projector (whilst important) isn’t necessarily the be all and end all. However, in a commercial or industrial environment, your projector will be fighting against daylight and the ambient light of a room. As such, it needs to be significantly brighter and with a higher contrast ratio in order to remain visible. For example, the Hitachi LPWU6500 has a light output of 5,000 Lumens in normal mode and a 20,000:1 contrast ratio, making it perfectly suited to commercial environments. A professional-tier projector will include features which are entirely absent from a consumer-level projector. For example, you’ll find that the LPWU6500 has a DICOM (Digital Imaging and Communications in Medicine) Simulation Mode, which projects grayscale images which approximate DICOM Part 14 specifications. This mode is ideal for viewing grayscale medical images, such as X-rays, for training and educational purposes. It’s a feature you won’t find in any consumer projector and paired with the durst resistant sealed engine for maintenance-free running, built in 3D support and 360-degree image rotation, it makes the LPWU6500 a superb option for any business. Previous PostCould your Business Benefit from an Interactive Touch Screen? Next PostIs the Sharp PN-Q601 Right for You?